← Smashburger Comes to Durham! Picture of the Week – Beer with a View! After a few brutal weeks of cold and wet weather we finally had a few beautiful days to enjoy this past weekend. My wife and I took advantage of this welcome change in temperature and headed out to explore downtown Raleigh. The picture above was take while enjoying lunch at Sitti, a great Lebanese restaurant. We had seats located by the windows looking out to activity on the sidewalk and intersection of Hargett & Wilmington Streets. 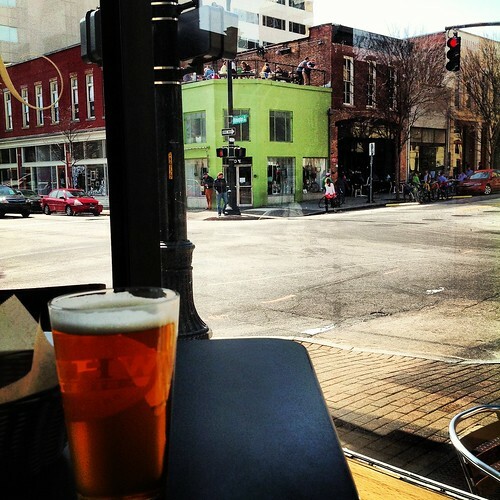 The green building in the background is Holly Aiken’s shop “Stitch” with patrons from Raleigh Times Bar enjoying some rooftop dining.